When approaching any home project, your first move should be to take a step back, analyze the situation and decide on your best approach. If you’re looking at cracked tile, filthy or crumbling grout, or bare spots on your tiled floor or backsplash, it’s time to do something. The question is: How do you figure out whether you need tile regrouting or grout cleaning services? Or should you just start from scratch with retiling services? The specialists at The Grout Medic will visit your home to help you assess the current condition of your tile and grout, and make a plan for how to proceed. Is your grout discolored, dirty or even cracked and crumbling? It’s time to take action! Cracked grout is a particular problem, as it allows moisture to seep under the tiles, increasing the risk for mold and mildew buildup. The longer you wait to repair broken grout, the greater your chances for needing water damage repair later on. If your grout is impacted with dirt, grime and limescale, the experts at The Grout Medic likely will recommend grout cleaning services using our special chemical-free, green steam system. After the grout is cleaned and dried, we will apply a clear or color sealant of your choice, to protect your grout in the future. Grout that is cracked and crumbling must be addressed. The grout between your tiles holds them safely in place, and its integrity is crucial to the entire surface. To perform a tile regrouting, technicians with your local office of The Grout Medic will remove the old grout, clean the spaces between the tiles thoroughly, then apply new grout to leave a fresh, clean-looking surface. There are many levels of tile damage and decay, from hairline cracks to chips to bare spots. You may not need to retile the entire floor or backsplash. Many times, minor issues can be repaired without the expense of an entire replacement job. 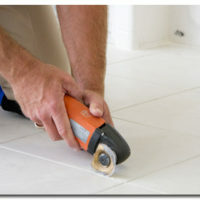 The Grout Medic can even perform recaulking for areas that require it following tile replacement services. In situations of water damage repair or significant wear, a full tile replacement will be necessary to restore your surface to like-new condition. If the area has experienced flooding in a disaster incident, or has been exposed to a long-term leak, it’s very likely that mold and mildew have started to build up. At the very least, the surface below the tile has become compromised and no longer has the proper integrity to hold itself up for very long. Rely on the expert eyes of The Grout Medic’s service technicians to bring your tiled surfaces back to life, and improve the look of your entire home! The Grout Medic has decades of experience addressing grout and tile damage and our technicians know exactly what to do to restore your home or business surfaces. Find your local office of The Grout Medic.